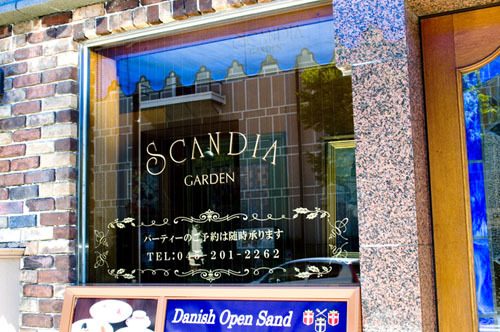 With a history dating back to the 1960s, Scandia Garden is a casual Danish cafe occupying an ancient-looking ground-floor dining room in front of Osanbashi Pier, with a more formal and much more expensive restaurant upstairs. The downstairs menu offers open-face sandwiches and casual but hearty main dishes like roast beef, veal cordon bleu and fried prawns. A main dish plus rice pilaf or bread plus coffee or tea is priced at Y1300 at lunchtime or just Y1400 at dinnertime, which starts at 4pm. 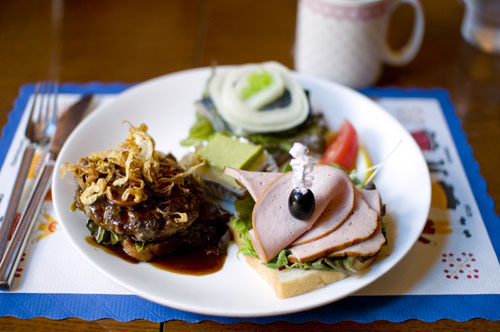 We enjoyed a selection of three mini-sandwiches - herring, cold meats and a mini-hamburger - served with cake as a lunchtime platter. Everything seemed very Danish in flavor, with decent bread, tasty baby-leaf greens and ripe tomato. If you're here for dinner, drink options include Carlsberg beer, Danish aquavit, and a wide range of time-warp cocktails with names like Moon River, Charlie Chaplin, and White Lady. An eclectic mix of easy-listening music plays in the background - we quite enjoyed a steel-drum rendition of "La Vie en Rose." 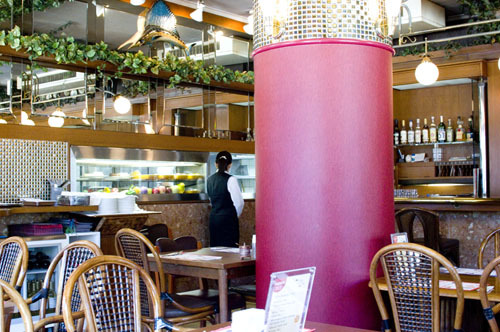 If you're after something fancier than simple cafe fare, the upstairs dining room serves full-course steak dinners, or an all-you-can-eat smorgasbord (Y6000 per person; minimum two persons). If you want to live it up like a Danish king at home you can get a mixed-herring platter and an almond cake to go (Y2800 each). Naka-ku, Yokohama, Kaigandori 1-1, Yokohama Boeki Kyokai Bldg 1F.